Sensational brand- or sensationalized advertising? 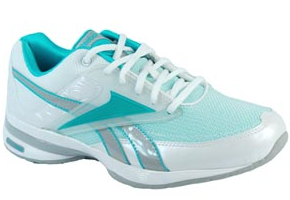 Toning shoes (as a category) had had explosive growth. Check out the graph below. Sales were $17 million in 2008; $245 in 2009 and over $2 billion in 2011 (Bohnhof, Jones, Swanson, and Moses: Reebok EasyTone Plans Book). That’s especially impressive when you consider that the athletic shoe category has been shrinking. There was a brand that drove a disproportionate amount of this growth: Reebok EasyTone. The positioning of EasyTone is straightforward: the brand is an easy solution to get rid of a flabby derriere. More eloquently, EasyTone provides extra tone and strength to leg and buttock muscles. Reebok emphasized its positioning by hiring the curvy (but firm!) Eva Mendes as poster child for its new line. What is interesting is this: Reebok EasyTone shoes caused the problem for Reebok. Yet, any consumer who purchased EasyTone shoes, capris, pants, shorts, bras, sleeveless shirt and short sleeve tops became eligible for compensation due to the misleading information. This suggests that the FTC believes that the misleading information spills over into different product categories. The fine, is levied against the brand- not against the product! What was Reebok's response to this? “On September 28, 2011, the Federal Trade Commission (“FTC”) announced that Reebok and the FTC have come to a settlement agreement on the FTC’s allegations regarding the U.S. EasyTone advertising campaign. The allegations suggested that the testing we conducted did not substantiate certain claims used in the advertising of our EasyTone line of products. In order to avoid a protracted legal battle, Reebok has chosen to settle with the FTC. Settling does not mean we agreed with the FTC’s allegations; we do not. Strong brands attract top talent. Top talent makes better decisions, which in turn strengthens the brand. Then, the strong brand attracts more top talent and the cycle continues. 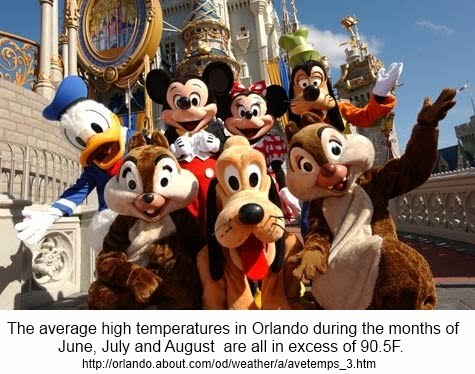 Who would want to spend an 8 hour work day jumping up and down in a non-breathable fuzzy costume in 100º weather- while making minimum wage? Not many people! But if the job is posted by Disney, then there would be a line-up for a job interview! Why? The magic of the Disney brand makes Disney is a highly desirable firm to work for. As a customer, you can “own” a piece of Disney magic during your stay. As an employee, you make the Disney magic! In this example, the brand name has a power of employment attraction that can not be explained rationally. Not all companies have as strong a brand as Disney does. So these firms are increasingly finding ways to make their firm more attractive to talent. One way of doing this is through third party sources such as “Canada's Top 100 Employers.” This annual competition, now in its 13th year, provides a one-stop shop highlighting the best places to work in Canada. The aim of the competition, as stated on the website is to “identify the companies and organizations that lead their industries in attracting and retaining employees.” Firms on this list are publicly acknowledged as being the best in their industry, making them increasingly desirable in the eyes of prospective employees. The preferred choice of employment gets tougher now for many people. Who would you rather work for: My favorite brand? 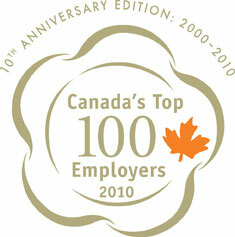 Or An unknown brand that is one of “Canada’s Top 100 Employers”. Of course, the two might be combined- which would be the ideal scenario! Society benefits from a more educated population. There are tons of studies out there that demonstrate how a more educated society has more innovation, higher standards of living, and is more peaceful. My personal belief is that education is wonderful because it facilitates social and economic mobility. Philosophically, then, I support the subsidization of higher education to make education accessible to people of all socio-economic groups. I love the rags to riches stories. That brings us to today. Tens of thousands of Quebec students marched and protested a $325 per year tuition increase. Their march blocked roads and made traffic jams. Their protest got commercial shipments late. Some sick people missed their doctor's appointments. Hard working employees were late for work. Munchkins in day-cares had to wait longer for mom or dad to pick them up. These are real costs to individuals and to society. The protests down the streets destroy economic value. To the "striking students", this is not the way to win friends and influence people. 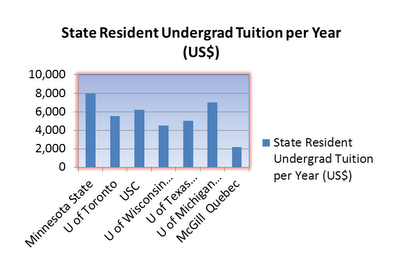 Let's put this student "tuition hike" in perspective. Since most of the student strikers are undergrads, I'll use undergraduate tuition numbers. I'll pit McGill University's tuition (for Quebec residents) against the tuition prices that they would pay at other comparable-tier schools. 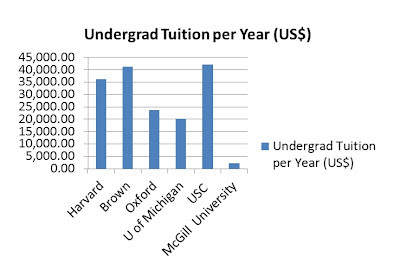 McGill's tuition is comparatively so low, you can barely see it on the chart. But wait a minute. Let's exclude the private universities from the comparative sets. Don't some of these state universities (like University of Michigan or University of Southern California) have privileged rates for state residents? 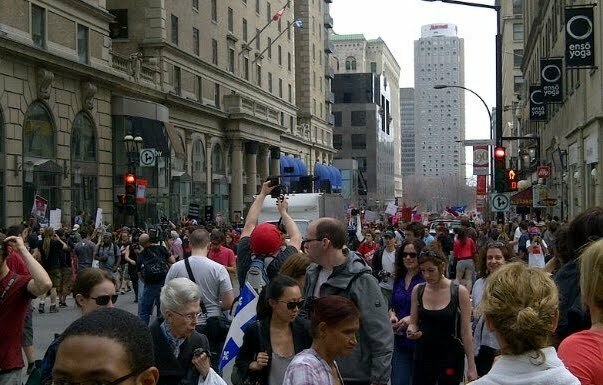 How would Quebec tuition rates stack up against these subsidized rates? Let's take a look. Here too, the Quebec rate is a huge bargain. In fact, it is the least expensive tuition rates in Canada (Bloomberg) and it doesn't come close to American resident state school equivalents. Why do universities charge so much? It is expensive to educate a student. Without accounting for overhead (you need classrooms, computers, projectors, pensions for staff, cleaners, security, cleaning staff etc), the marginal cost for educating each additional student is about $16500 per year. This is why even private schools with huge endowments charge around $35k per tuition per year. One of the coolest things about working in academics (especially at a place like McGill) is meeting world-class subject experts. I've engaged with profs who have won the Order of Canada, advised American presidents, and who have been nominated for Nobel Prizes. Many others have been inventors while others have been on the cover of magazines. These are individuals, who are paid thousands of dollars per day for their expertise in the business world. Yet, they choose to be in lower paying university environment because they love their field and enjoy sharing their passion with students. It's not a bad deal to pay $400 per a course to learn from a world expert who commands $7000 per hour long speech. Obviously, most profs are not at this level, but the professorial talent bench is often stocked with best-in-subject matter experts. Ever wonder how much a university degree is worth? According to "The Big Payoff: Educational Attainment and Synthetic Estimates of Work-Life Earnings" (.pdf), high school graduates can expect, on average, to earn $1.2 million over the course of their lifetime; those with a bachelor's degree , $2.1 million; and people with a master's degree, $2.5 million. So an undergraduate degree is worth about $900,000. So the $1625 tuition hike over the course of an undergrad degree ($325 x 5 years) represents about .1% per year hike of future earning benefits that the undergrad degree provides. The hike is not a lot. We are left with this reality. The annual tuition increase amounts to less than the price of an iPhone or pair of designer jeans. The $1625 and is a pittance of future income earning benefits the degree provides. Education has a very simple value equation. Tuition is way under priced. The benefits of a degree even with full market tuition is still worth it. ($200,000 in tuition for $900,000 in benefits) This blog is a reminder to striking students to learn this most basic value equation. If striking students can not understand this, perhaps university is not for them. Over the period of one week, Joseph Kony went from world-wide obscurity to household name. Kony, of course, is the Ugandan warlord who is responsible for the abductions of thousands of African children and forcing them to become child soldiers. Invisible Children, the not-for-profit charity that seeks to put an end to the practices of groups which abuse children and force them to serve as solider slaves, is responsible for Kony's sudden infamy. They allege that Kony (and his Lord's Resistance Army) has done this more than 30,000 times. The allegations are shocking, horrific, and disturbing - and supported by UN research. In 2005, Kony was convicted of war crimes by the International Criminal Court in The Hague, Netherlands but has since evaded capture. This video, "Kony 2012",produced by Invisible Children and distributed on YouTube launched a campaign to make Kony famous and expose his war crimes. The video's purpose has worked. There are 85 million plus views on YouTube and Kony 2012 has been competing for top news story billings on National News programs. But why did this video go viral? Invisible Children has made 278 other videos (19 others are on YouTube) and they didn't catch on. All-star reporter Anderson Cooper has covered the Kony story for years - and it didn't stick. On top of all of that, Kony's story is not really time sensitive. After all, he's been doing this sort of thing for 26 years (according to the Kony 2012 video) and was convicted of war crimes almost 10 years ago. A lot of bloggers and talking heads are trying to explain why this video went viral. Some are saying it got traction because Rihanna tweeted about it. Sure that helps, but I’ve also seen Tweets about celebs liking an Obama speech but those videos have only a few thousand views. Some bloggers have been talking about the high quality production of the video. Yep, that could help too but there are tons of high quality production videos out there that don’t catch on. Forbes posted a shopping list that seems to have assembled 12 of the most common arguments why the video caught on. To me, discussing the most successful viral campaign to date requires some deeper reflection. I’ll share my perspectives on why this video took off by asking three key questions: 1. Who is this video about? 2. What is the message of this video? 3. What kind of news do people tend to pass on? Who is this video about? “Kony”, right? Actually, I’ll argue that’s not the right answer. The video is really about the viewer: How connected he is to the world; how empowered he is; how he is part of an experiment; how he needs to be aware what is happening to his brothers and sisters in other parts of the world; how he can help bring Kony to justice. Understanding this point lays the foundation for understanding the viral magic of the video: The video is personally relevant to you, the viewer. What is the message of the video? I’ll bet if you asked a 100 people, you’d get a pretty consistent response: “Kony is a really bad guy and we need to stop him from being nasty to kids.” The message is so simple that even a child (like Gavin in the video) can understand – and communicate it. The message- supported by its simple visuals- is the essence of cognitive ease. In such a complicated world, here is a problem we can understand and tackle together. What kind of news do people tend to pass on? The Kony story contains very bad news and the information is very extreme. What is interesting here is that this is the opposite kind of news that people tend to pass along. There is a lot of anecdotal evidence (as well as theory) to support the tendency for people pass on more central (rather than extreme) information. This is something called the centrality hypothesis. Simply put, the information-sharer does not want to look like a moron passing on information that might not seem plausible to the listener. In addition, the information-sharer tends to pass along positive information, rather than negative information. This is the "don't kill the messenger" effect. (Some research by Chip Heath explains these concepts really nicely.) These insights, help to explain why feel-good videos like “Charlie” tend to get passed around but do nothing to explain why Kony 2012 gets passed around. So why was Kony 2012 able to “go viral”? Here's an explanation. The information on Kony 2012 matches the emotional valence of the conversation topic and this makes the video safe to be shared. So even though the information is extreme (child mutilations/child soldiers) and negative (suffering, pain, bloodshed), it is passed on. The viral success of the Kony 2012 video has hit the record books as being the fastest viral growth video on the internet to date. Congratulations to Invisible Children for such a well-executed campaign. To me, it is especially impressive because it overcomes the natural disadvantage of getting extreme negative information to spread. 1> The communication needs to be relevant for the audience. 2> The content ought to be designed for cognitive, emotive and action ease. 3> The tone of the content ought to be consistent with emotion of the conversation. Invisible Children's execution of these 3 points helps explain the communications phenomenon of Kony 2012.